At long last the mail seems to have found us. It’s been coming in in a steady stream for a week now but it was not till yesterday that I started to benefit from the discovery of our whereabouts. The letter that came in yesterday was yours of the 24th Jan and today I got another seven including yours of the 1st Feb, two from Ivy, one from Mae Menzie and one from Rex Wedd. I also got a parcel from Mother of PK’s, razor blades and things but as I know the trouble it must be to get these things I’d rather you didn’t bother because the army will see that we don’t run out of blades and one can always get soaps, toothpaste and shaving cream- I think I’ve got about six tubes in my pack now – besides which not many parcels make the grade these days unless you keep the postal authorities informed of changes of address the parcels are sent to the hospitals and in our case especially being seconded from the unit and with a change of address every few days even the income tax collectors would be hard put to it to keep track of us let alone postal authorities. The heat wave of which you wrote seems to have hit all over Australia. Youngster said it was tough in Melbourne and Mrs Toomey also mentioned the heat in Sydney. 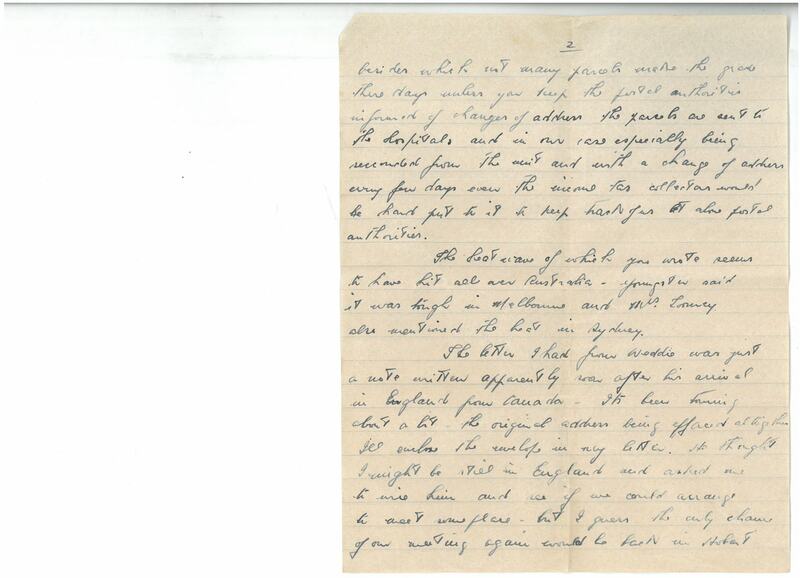 The letter I had from Weddie was just a note written apparently soon after his arrival in England from Canada. It’s been touring about a bit – the original address being defaced altogether. I’ll enclose the envelope in my letter. He thought I might be still in England and asked me to wire him and see if we could arrange to meet someplace, but I guess the only chance of our meeting again would be back in Hobart when the argument is over. We’re quite settled in in this show now – although as I mentioned in my last letter we’re only attached, the attachment has every appearance of becoming permanent so of course we look like staying here. Time and for that matter everything else has ceased to interest us – a month ago we looked a cinch to go home, half the mob had already gone when something happened of which you’ve probably read and we got rushed orders. Then when half the crowd had taken a trip they decided they didn’t need us for the job so having been taken from the command to which we were attached, new forces took over the work of disorganising us so that’s now we came by the present address. We can’t take a trick anywhere even the weather is against us – real cockies weather – rains every night and fines up early in the morning for parades and rookie drill that we’d almost forgotten in the show. The highlight of the week was provided by the sinbuster at Sunday’s church service – he based his talk on hypocrisy and got real het up over it. Someone must have got under his skin during the week because he got so hot under the collar that at one stage he offered the battalion out – an excellent gesture of course to win the approval of the mob, but not likely to influence their minds. We’re certainly living well here – we’ve had fresh meat twice in one week – a most unusual experience up here, but of course this show might bet a better go with staff being more or less permanently based here. I must say cheerio now Mother and Dad. Give my love to May, Anne and Carline and regards to the boys. 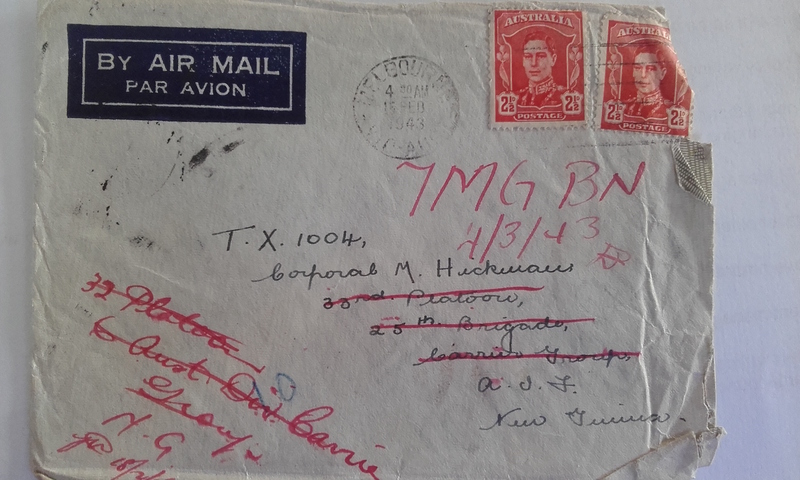 This envelope from Ivy’s letter shows why news from home was sometimes slow to arrive. Quite settled in this show…. 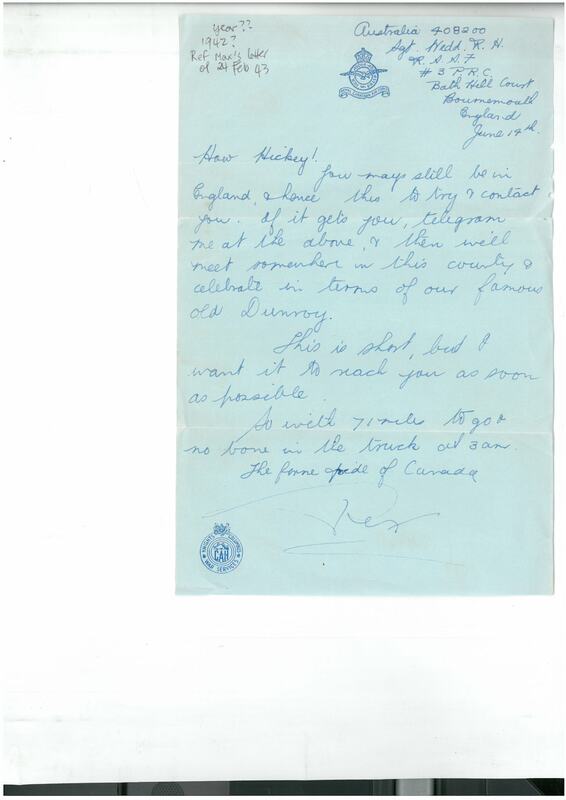 This letter had travelled the world for 8 months! You may be still in England & hence this to try & contact you. If it gets to you, telegram me at the above & then we’ll meet somewhere in this country & celebrate in terms of our famous old Dunroy. This is short, but I want it to reach you as soon as possible. So with 71 miles to go & no bone in the truck at 3am. 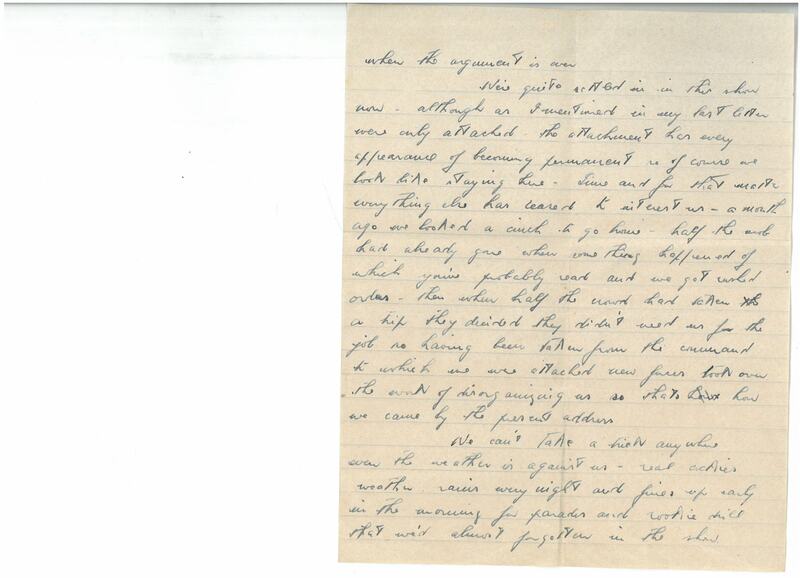 Relevant to comments in recent letters is the fact that the 7 Machine Gun Bn was a Militia Battalion. 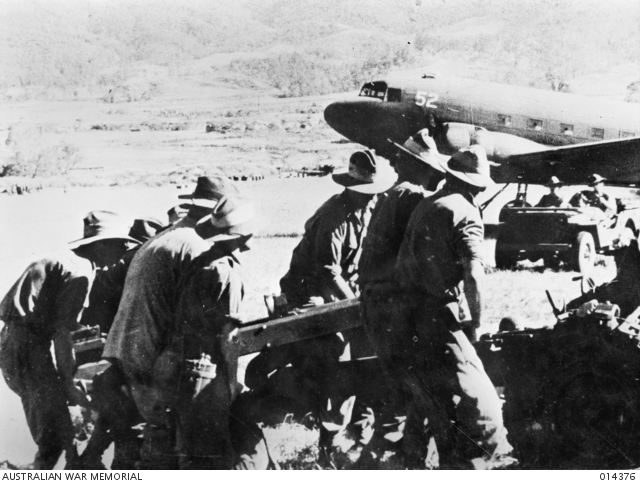 25 pounders are unloaded at Wau aerodrome. At this stage the Japanese were only a short distance from he aerodrome. These guns were assembled and went straight into action. AWM P02497.059 Probably Port Moresby, New Guinea. c. 1942. 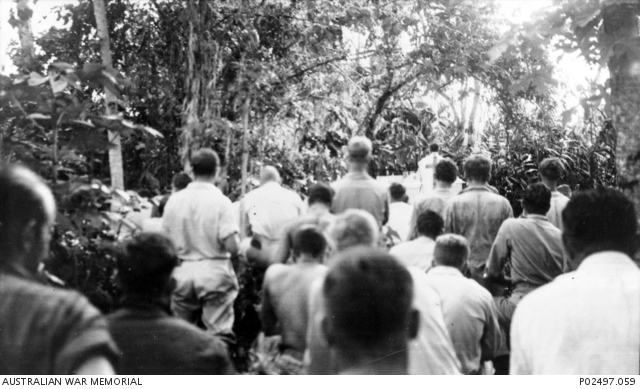 Men of the 32nd Australian Heavy Anti-Aircraft Battery at a church parade. 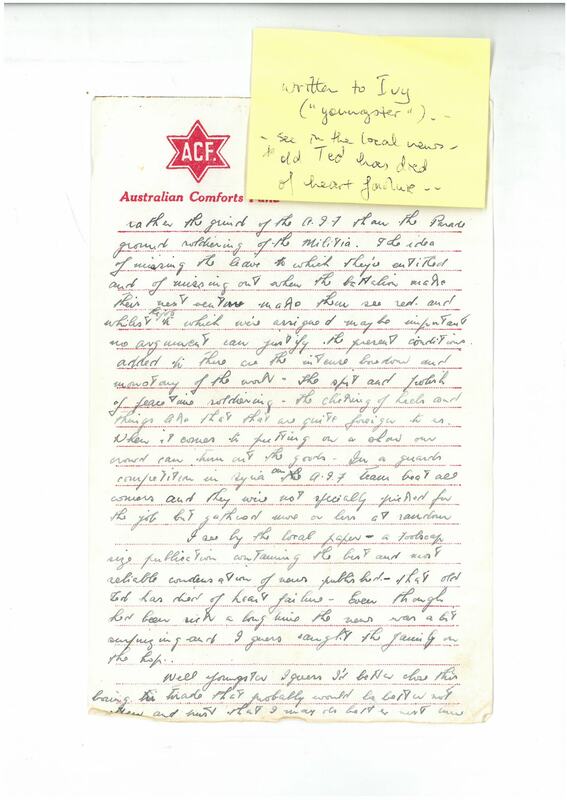 … rather the grind of the AIF than the Parade ground soldiering of the Militia. The idea of missing the leave to which they’re entitled and of missing out when the battalion make their next venture make them see red, and whilst the job to which we’re assigned may be important no argument can justify the present conditions added to these are the intense boredom and monotony of the work. The spit and polish of peacetime soldiering, the clicking of heels and things like that, that are quite foreign to us. When it comes to putting on a show our crowd can turn out the goods – in a guards competitions in Syria an AIF team beat all comers and they were not specially picked of the job, but gathered more or less at random. I see by the local paper – a foolscap size publication containing the best and most reliable condensation of news published – that old Ted has died of heart failure. Even though he’d been sick a long time the news was a bit surprising and I guess caught the family on the hop. Well youngster I guess I’d better close this boring tirade that probably would be better not written, and trust that I may do better next time. 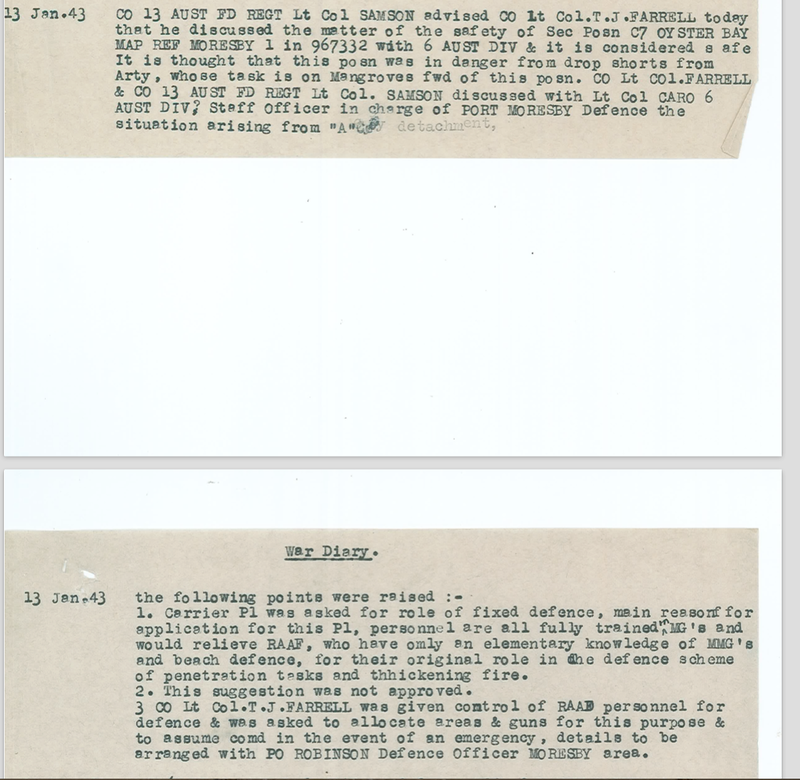 As mentioned above (regarding the Battle for Wau), the 7th Machine Gun Battalion to which Dad was now attached was a Militia unit, and the experience here seems to have reinforced his views about the Militia in general. It’s interesting that he now attributes drills/ ‘parade ground soldiering’ to the fact of this being a Militia unit whereas similar experiences with daily drills in England and Syria were attributed to the fact of being in barracks. Hmmm….. Article from the Hobart Mercury. 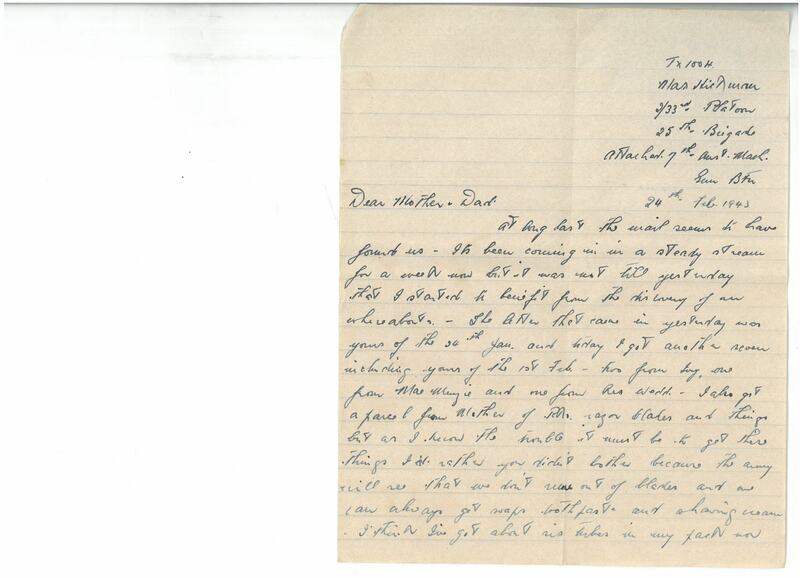 Letters received from both Ivy and their father refer to Ted Elliott’s death in early February (cremation notice was dated February 9). The article which appeared in The Mercury regarding his death describes the circumstances of the event. 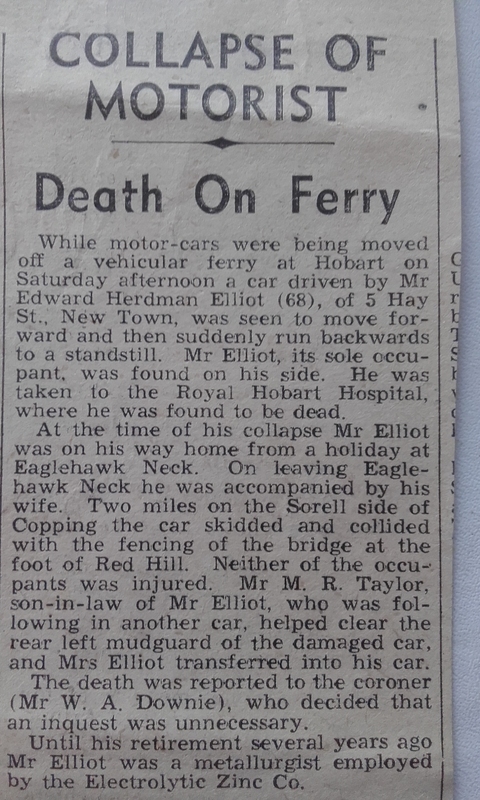 It seems likely that the unusual nature of his passing, rather his standing in the Hobart community, might have been the reason it was noted in the New Guinea news sheet. The car ferry Lurgurena on which Ted Elliott was travelling when he collapsed. 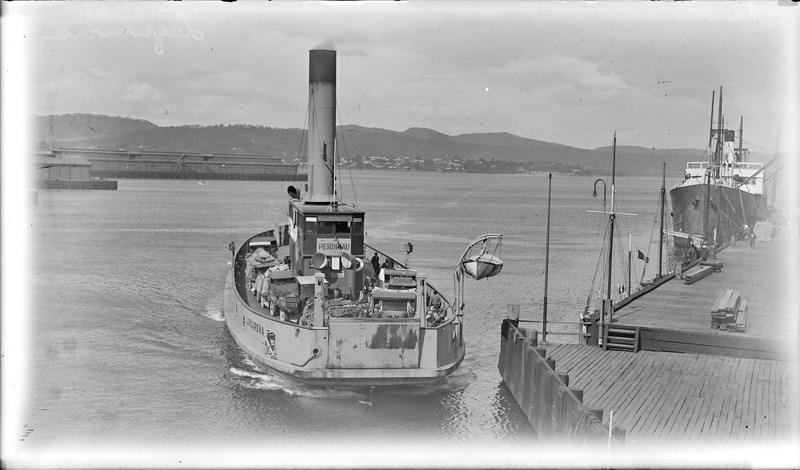 Photo from the Tasmanian Archives’ Mercury Historical Collection. Correspondence from the Holy City is apt to be somewhat irregular these days – there is a new boss in the house you know, and at times he is inclined to be autocratic – not surprising when you think of his ancestors on both sides of the family. The day starts at 5.30am and if everything goes according to schedule I can climb into my little bed at 11 pm to sleep the sleep of the just – until about 4am when there is a brief interlude of pants changing. No wonder Fergie said like was one nappie after another. It is nothing to have twenty on the line per day. Last Saturday for the first time, I had a little walk round the house, and since then have gradually taken over my usual duties plus. Bill helps a lot, but there is still plenty to keep me out of mischief. So far I have not been out of the gate, but tomorrow night Bill is taking both Max and self to the doctor. Young Max has to be weighed, and the doctor wants to give me the once over. I am quite looking forward to the outing. The recent heat wave wrought absolute havoc in the garden. Peas, beans, tomatoes & cucumbers were burnt to cinders, the only survivors were the potatoes and onions. It was a heartbreaking sight after all our hard work however it’s all in the game. In startling contrast was the news contained in a letter from home which arrived yesterday. Dad said they had a marvellous crop of broad beans, french beans, cucumbers, tomatoes, peas and potatoes, in addition carrots, parsnips etc are on the way. Sounds as though the Pater has been putting in some very hard work. From a cutting headed ‘cremations’ enclosed in Dad’s letter, I gather that your friend ‘old Ted’ is now free from financial worries. The position is a bit delicate, knowing the family so well, and their opinions of the head of the house, and hopes etc. I can hardly write to express sympathy in their ‘sad bereavement’ so think it best to do nothing about it, you know ‘least said’ etc. Every day we have been expecting to hear from Sydney where, unless some further hitch occurred, young Drew is spending a long looked for Leave. As Bill said ‘they won’t have stopped talking yet’ so we can’t expect to hear for awhile. John dropped in on us again last week, he was in Melbourne to see about a transfer to the senior service – seems to have quite a good chance too. I suppose you have already heard all abaout the Militia Bill – no wonder other countries raise their eyebrows, and turn up their noses in disgust. Bed is the most desirable place I can think of just now Max. One of these days I will be quite accustomed to the routine and take it all in my stride, in time I will probably look back and laugh, in the meantime I feel really desperately tired so will say Cheerio for the present Max. Bill and Cobber send their kindest regards. Lots of love from Max and self. 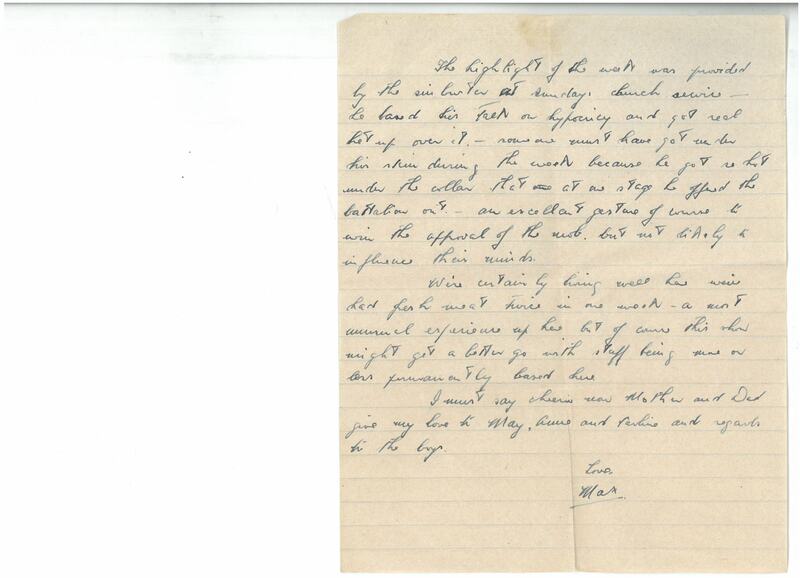 This entry was posted in Food and Drink, Letters to/ from others, organisation, parcels, The course of the war and tagged militia, Rex Wedd, Ted Elliott. Bookmark the permalink.